Last week I came across this on ebay. 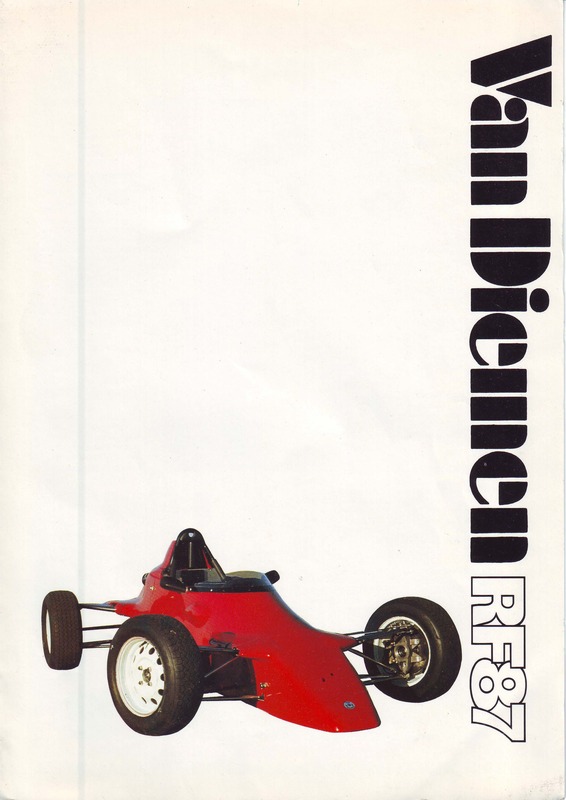 A sales brochure for my 1987 Van Diemen RF87. So I had to buy it. Although the RF87 is extensively modified and redesigned, it nevertheless retains much of the all conquering RF86 concept which last year won 24 national and international championships and the Formula Ford Festival. Whilst the new car is a further development of this advanced technology design we have gone to extreme lengths to keep the car practical, straightforward and durable so that all drivers can prepare and race their cars on differing circuits with the minimum of effort. As standard, the car is fitted with a full 6-point Willans seat harness, a fully plumbed automatic fire extinguisher system, a cast alloy sump, aeroquip lines, mirrors and an extensive range of body colours. Resulting from several months of thorough wind tunnel and track testing the distinctive Van Diemen shape incorporates many detail changes achieving low drag coefficients and the most aerodynamic package yet, which further increases straight line speed and acceleration. The new design consisting of a multi-tubular frame which utilises high quality round and square aircraft specification tube, conforms to all the new regulations as laid down by the FIA in respect of footwell location and minimum cockpit cross-sectional areas, Extensive bracing in the cockpit and dash hoop areas combines to give additional torsional rigidity to the chassis with more driver safety and comfort. The main roll-over and dash hoops are full FIA and S.C.C.A approved. The chassis is extensively braced in the footwell and cockpit area to avoid chassis deflection and provide additional driver safety in the event of accidents. A rubber bladder fuel cell conforming to FIA/SPEC/FT3 is fitted as standard, and ignition components have been relocated to conform with the new 1987 safety regulations. The all new push rod suspension as used on almost all F1 Grand Prix cars, operates through bell-cranks to horizontally located gas filled Bilstein dampers mounted behind the dash hoop. The top and bottom wishbones of flat oval section pick-up on universal high tensile cast uprights , which have simple camber, caster and toe-in adjustments and are recessed into the wheels. chassis. As with the front suspension, universal high tensile cast uprights are used, recessed into the wheels and with simple camber, caster and toe-in adjustments. Bilstein gas dampers, which are ducted for cooling, are located along with the oil tank in the gearbox module. The two side mounted radiators with increased capacity have been moved forward 8″ from the RF86 position resulting in more efficient cooling with better air flow and weight distribution. The braking system (as with the clutch) is fully aeroquipped throughout, with 10″ front and rear Van Diemen discs, located outboard and operating through cast iron calipers. On the back cover are photos of the previous year’s RF86. Formula Ford is traditionally the way into single-seater racing and young drivers hope it is a step on the path to a Formula One seat, though most FF drivers of course do not make the grade or have the luck. So back in 1986 when the brochure was produced we have four successful young Van Diemen drivers and nobody knew what the future held for them. Paul Tracey, in his winged RF86, was just sixteen when he won the Canadian Formula Ford championship in 1986. He went on to have a career in Indycars in the States and last year Autosport magazine named him one of the 50 greatest drivers never to have raced in Formula One. He still races today. Jason Elliot was 18 in 1986 when he won the British Formula Ford 1600 champion but I don’t know what became of him after that. Philippe Favre from Switzerland came second in the British Formula Ford championship in 86 in his Van Diemen and went on to have a successful racing career, driving in Formula 3, F3000 and Sports Cars at Le Mans. Tragically, he was killed in a skiing accident last month in France at the age of 51, just three weeks before Schumacher’s skiing accident. Finally we have Roland Ratzenberger who in 1986 he won the Formula Ford Festival at Brands Hatch. Eight years later he did win that elusive Formula One drive but tragically he was killed in qualifying for the San Marino Grand Prix in the April, the day before Senna died in the race itself. What a find! Thanks for sharing; best wishes for 2014……looking forward to seeing this years paint job! Hi, thanks for sharing this, I have one question, can I buy it off you? Sorry,I have now sold the car and the brochure.